All transactions are safe and secure with a reliable history in online purchasing behind each of our associates. Buy the Alan I Heart My Labrador Hangover 2 t-shirt to own Hangover 2 clothing and merchandise. The I Heart My Labrador shirt design shown here was inspired by Alan's computer sticker and love for his faithful friend. His gold Lab means so much to him that he had a yellow shirt made with a picture of his dog on it that he wears throughout the Hangover 2 movie. 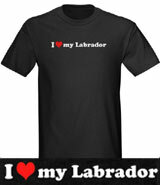 If you love your Labrador as much as Alan loves his then snag this tee today. It is available in classic black or a variety of colors to suit your needs. In addition to the Alan I Heart My Labrador Hangover 2 tee above, browse the Hangover 2 Clothing Gallery for more apparel like men's and women's clothes, kids shirts or hoodies.